So Thanksgiving, we meet again. You bring with you the sound of our aunts and uncles laughing, our cousins racing through the over-crowded hallways, dad’s terrible jokes and, of course, mom’s smothering questions about our lives. But year after year we keep coming back. Why, you ask? Because nothing is better than that first bite of grandma’s famous pumpkin pie. Every family is different so Thanksgiving means a lot of different things for students, but one thing’s for sure: after family, the number one thing we’re grateful for is the food. And there are some dishes that we just couldn’t live without. Turkey. What would Thanksgiving be without turkey? Tania Castillo from the University of San Franciscosaid that her family’s turkey is one of the best dishes of the night. “My mother roasts turkey with a special lemon and garlic marinade; It's amazing,” Castillo said. However dry or moist you like yours, the fact remains: no turkey, no holiday. Stuffing. And let’s face it, what’s turkey without stuffing? For those who can’t stand turkey, stuffing is probably be the only thing bringing salvation to the dish. Besides, it's so much fun to stuff yourself full of stuffing – that's what special Thanksgiving pants are for. So here’s to stuffing being the Robin to turkey’s Batman. Honey Baked Ham. Maybe not a favorite for vegetarians, but for the carnivores of the world, the sweet taste of this delectable meet goes well with anything placed on your plate. Isabella Diaz, from Mount San Antonio College, said that amongst mashed potatoes and all other dishes served, honey baked ham still remains on top. Hawaiian Bread. This isn’t just any bread, this is Hawaiian bread, the bread that will catapult your senses into a frenzy of delight when eaten with any dish, mashed potatoes, turkey or candied yams. Just be careful not to stuff yourself full of it, because you have to leave room for desert. Candied Yams. Especially when coated with a layer of marshmallows, this dish is the one exception to the rule “dinner before desert.” Courtesy Clerk Brandon Wick from Stater Brother’s Grocers said that candied yams are one of the items that cause the most traffic within the store during the potluck holiday season. “You wouldn’t think so, but it’s true,” Wick said. With the sweet delight just a quick purchase away, it’s no wonder those shelves are emptied first. Tamales. 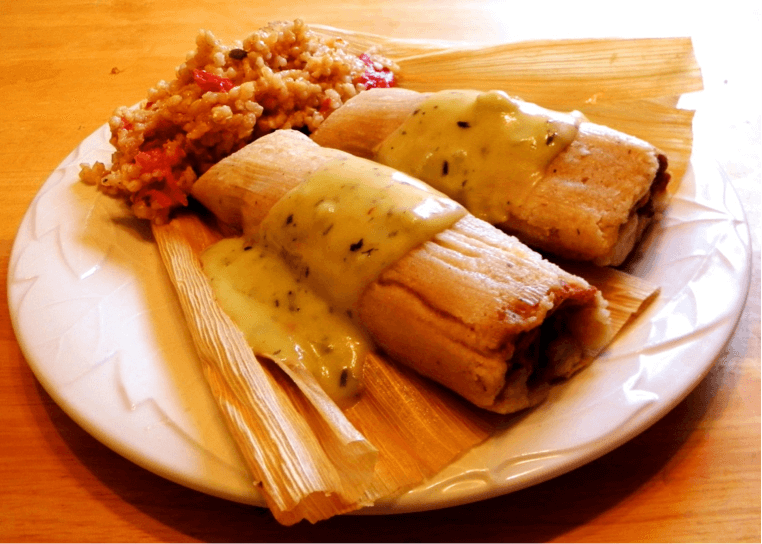 This dish only comes out on special occasions, and if you’ve ever been around a Spanish family during the holidays (or lived in California or Texas), you know that from Thanksgiving to Christmas tamales are on the rise, and you’re in for a treat. For Diaz, the real treat isn’t just eating the tamales, but preparing them as well. “We all get together at my grandmas and prepare them, and then we cook them on Thanksgiving,” Diaz said. [Insert] Pie. Pumpkin pie, apple pie, sweet potato pie, key lime pie… pie, pie, pie. There isn’t much persuasion necessary for the consumption of this dessert. It’s the one thing that we wait for incessantly all night and aren’t too peeved about eating for the next week (if any leftovers survive the end of the night). So if all else fails that night, grab some pie and wait for Black Friday in a couple of hours. That might be the one thing people love more than pie, shopping. Of course, though food is great and we love to eat, the merriment of family and the comfort of being home might be the best thing for a college student to consume this time of year. “Nothing should ever be more important than saying thanks to the people around you, especially family, so Thanksgiving is a great opportunity to stop and appreciate that,” Castillo said. In the midst of tamales, mashed potatoes and Hawaiian bread, the laughter and good times that our families bring to the table are what keeps us coming back for more each year.